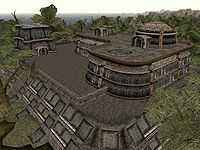 Hlormaren is a Dunmer stronghold that lies just west of Balmora. It is one of the ancient strongholds of a brighter time for the Dunmer, located in the central Bitter Coast, west of Balmora. The stronghold has a total of five levels; the sewer, underground, bottom level, top level, and roof top. A point of interest is that Hlormaren is one of the few strongholds with a sewer system, which is directly connected to the sea west of the stronghold. This entrance is not of much use, however. The strongholds seem interesting to the traveler, but should be approached very carefully. They have largely been abandoned, but have since generally proved attractive to whatever group feels strong enough to hold them. At last report, Hlormaren has been taken over by slavers. The underground has a total of seven slaves, while the roof top also has a room containing two slaves. The agent Avon Ravel offers major training in Short Blade, Light Armor, and Sneak if properly calmed or snuck up on. Hlormaren has a propylon chamber linking to Marandus and Andasreth. The Andasreth Propylon Index is on a shelf in the dome on the roof of the fort. A Scroll of Windwalker is in the Keep, Top Level. A couple of chests contain the Hlormaren Slave Key to use in the basement levels. The Hlormaren Propylon Index can be found for sale by Irgola the Pawnbroker in Caldera. Miscellaneous items lay throughout, mostly clothing, some potions, housewares, etc. *For unknown reasons, Ushat has the feminine prefix "gra-" on his surname instead of the masculine "gro-". This page was last modified on 19 October 2018, at 22:37.